I’m just finishing off my PhD at the moment, writing my thesis in which I have been studying the role that microRNAs (short ‘junk’ RNA) play in epidermal wound healing. What/who motivates and inspires you? 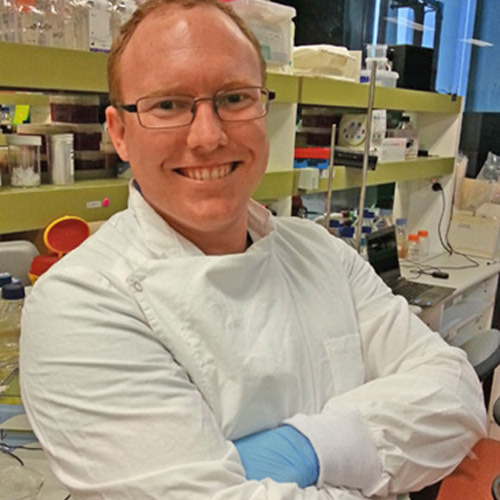 I previously studied at UQ in the department of Oral Biology and Pathology of all places. I was looking into Insulin-like growth factor binding proteins in gingival and periodontal ligament tissue. What made you choose science? Well I think curiosity brought me to science. I’m the son of a seamstress and a cabby from northern NSW, so it doesn’t exactly run in the family, but Mum and Dad bought me a secondhand microscope and chemistry set when I was about 9. I still remember looking down the microscope at water Dad and I took from a nearby creek and watching who-knows-what swim around frantically in that tiny drop. I would also put on science demonstrations for the neighbours using my chemistry kit. Stuff that I thought was amazing, but what I now know to be acid/base indicators changing colour with pH! Favourite science teacher and why? Definitely Mr. O’Conner. He was a cane farmer turned high school chemistry teacher with a passion for seeing science in the mundane. I remember him turning on a tap and exclaiming ‘Amazing!’. At first I thought he was a nutcase, but I came to learn that the water coming out of that tap is in the state it is because of so many interesting properties of water molecules that make life on our planet possible. It’s so weird what sticks in your mind sometimes. What do you hope to achieve in the next 12 months? First and foremost, finish off my PhD thesis. Next I’m looking to find work in a niche that bridges fields or concepts. Like my PhD, in that I have tried to incorporate lessons learnt from cancer metastasis into wound healing and learn something new from this. I haven’t travelled much yet, but a spot that I escape to (close to home) is the mouth of Tallebudgera Creek, down near Burleigh. It has beautiful forest walks around the headland, surf beaches, secluded beaches and a few nearby shops for fish ‘n’ chips. If I wasn’t doing this (job) I’d be…. When things aren’t working in the lab I joke about becoming a landscape gardener. I’ve always had an interest in plants. However, being a ginger means I would spend most my earnings on sunscreen. So I’m not sure that’s a viable option.